Every artist has their own unique way of jotting down ideas. For centuries it has been a typical leather bound sketch journal, which still can be found in every color and price range in Barnes & Noble. I have had many and they still sit on my shelf in my office/studio. With the release of the iPad Pro and Apple Pencil it has become more popular to download a moleskin, morpholio, DayOne or other journals. I use to have an app called Idea by Adobe. I loved that app, I could collect images, sketches, type or add handwritten text on each page. Adobe has scraped the app and left journaling to other company’s. Too bad cause that app let you collect ideas in images, sketches, type and handwritten notes. To date I have yet to find another app that checks all these boxes. The following are a few I have tried. Morpholio Journal is reasonable subscription of 3.99 a year to keep journals, you can add images, variety of paper, sketch and add text block with variety of fonts. However you can’t add to text block. Which is not a little nuisance. It’s a non-starter for me. Moleskin (as seen in image above) has a nice interface, love features but can’t sync journals between devices. I need to see my ideas on the go and sometimes I dont have my iPad Pro with me and would like to see those ideas when I’m at art store for example. Paper by WeTransfer. No text type tool- Nope! Paste by WeTransfer. This was interesting and actually I settled and decided to use this one to collect my ideas. You can type and add several images per card per deck. It’s set up more like slides and each slide you can add images and videos. You can type long block of text. However you can’t sketch on the cards. I would really like to sketch and type and add several images but I have yet to come across an app that does all three. DayOne- This app is great to add one pic and write long blocks of text. 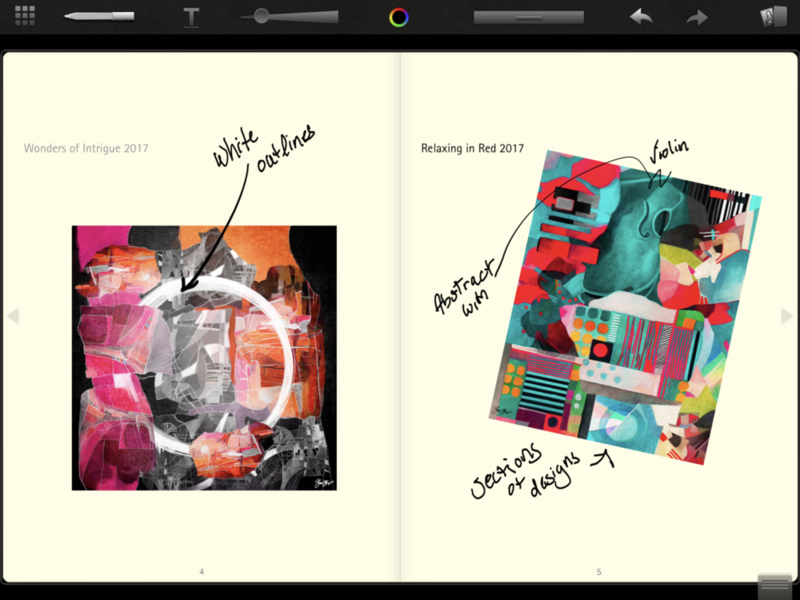 They have added drawing opting but its not like an art journal where you can move images and sketch on top of images. It set up like a diary. Maybe I am missing the best app that does all 3 things in a creative way. If you know of an app that checks all the boxes please leave a comment or email me.